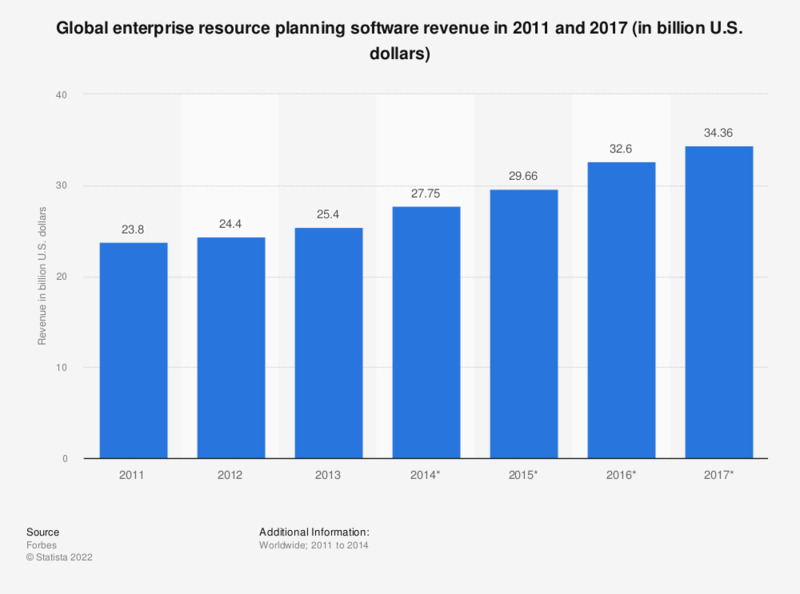 This statistic shows the global revenue for enterprise resource planning (ERP) software from 2011 to 2013, and a forecast for 2017. By 2017, global revenues for ERP software are predicted to reach 34.36 billion U.S. dollars, this is in line with other estimates for the global ERP market. ERP software is business process management software designed to ease or automate many of the back office functions relating to human resources, services, and technology. This provides the integration of many facets of modern business operations, such as product planning, manufacturing, and marketing, within a single program or program suite. The target customers of ERP software are generally large businesses, whose processes and systems are more complex and require software assistance to manage effectively. While ERP software for smaller businesses does exist, such software is often tailored to a specific industry.